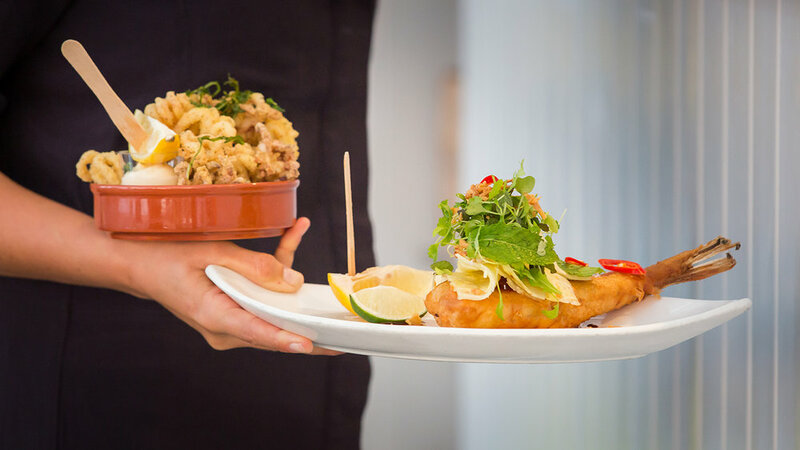 Our menu continues to produce a high quality cuisine with a creative tapas selection and contemporary dishes. All of our ingredients come from the freshest and finest produce, sourced locally where possible. We are renowned for our ‘build your own breakfast’, fresh juices and extensive vegetarian and seafood tapas. We will always try to cater for any specific dietary requirements. Our children’s menu is available all day and high chairs are provided. Coffee is supplied by our friends at Origin, Cornwall's independent coffee merchants. With a full drinks license, why not come down and enjoy a glass of fizz, a local beer or a simple gin and tonic. Please note these are only sample menus & we change our menus regularly. sit back and relax at our open air cocktail bar with its panoramic views. From the fisherman’s chapel on the island, past the boiler of the alba shipwreck, along to the rugged cliffs of clodgy view, our fresh, innovative cocktail list will bring you the classics with a twist. Come along for a pre-dinner cocktail, enjoy them at the comfort of your table, or just grab a stool and take in the view.